Singapore -- Although we are in the information age, digitization and globalization have contributed to the pollution of information, particularly news, which has increasingly turned into a commodity produced and sold for a profit. Shelton A. Gunaratne, the lead editor and author of this volume, says the aim of the contributing authors was to encourage the emergence of a different breed of journalists “who could bring about amity and sanity in the world community.”Their objective is to lay the foundation for building a new genre of journalism, which they have chosen to call‘Mindful Journalism,’ with a heavy emphasis on principles and concepts contained in the Buddhist middle path (magga). Thus the authors derived the idea of Mindful Journalism from the Buddha’s Four Noble Truths, with the main emphasis on the fourth truth delineating the three dimensions of the magga - wisdom and compassion (panna), morality and ethics (sila), and concentration and mindfulness (samadhi). The term mindfulness comesfrom‘Right Mindfulness’(samma sati), the second aspect of the samadhi dimension. Because Buddhist phenomenology has no divine origin or inspiration, it encourages mindful insight to seeing things the way they really are, it inspires open debate, discussion, investigation and practice. The authors argue that such inspirationis ideal for developing a new breed of journalist that will work for the public good rather than the commercial needs of the media owners. The ‘Four Noble Truths’ address as the first truth that life is suffering (dukkha), which leads to the second truth on the arising of suffering because of desire (tanha) and clinging(upadana) created by ignorance(avijja); the third truth asserts that cessation of suffering is possible by removing its causes, and the fourth truth spells out the path one should follow to cease suffering.The fourth truth is also known as the Noble Eight-fold Path or the Middle Path(magga) towards attaining the state of Nibbana. The book contains much discussion (some of it may appear too philosophical to a journalist without a basic understanding of Eastern wisdom) about various aspects of the Buddhist phenomenology along with a sprinkling of Hindu and Daoist philosophy. The first three chapters explain and translate the essence of Buddhist teachings on suffering (dukkha), impermanence(anicca) and no-self (anatta) in relevance to the practice of modern journalismthat involves reporting of poverty, social change, economic fluctuations, etc. Chapter 4 focuseshow a journalist assuming the role of kalyana-mitta (wise adviser) could play a significant role by developing his/her mind to analyse complex issues, seeing these in the context of interdependent and interactive variables that are ever changing. It is these changing outcomes – anicca – that we call news events. Chapters 5 and 6 go further into the meaning and application of dependent origination (paticca samuppada) model system thinking, to show how journalists could focus on the close connection between nature and human beings, to enable them to understand problem solving to report on the changing nature of developingnews events. Chapters 7 to 9 look at the fourth Nobel Truth of the path to eradicating suffering with each path related to journalistic practice. They look especially at how journalists could produce copy that promotes amity and sanity. Chapter 10 explores the wisdom(panna) aspects of the path from a journalism practitioner’s point of view with examples to show how the Buddhist teachings such as in the Five Precepts (panca sila) and Mindful (vipassana) Meditation concepts could be adopted to journalism practice. 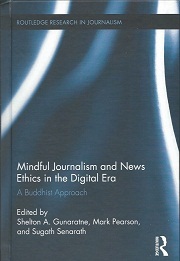 In the concluding chapter the authors point out that one need not become a Buddhist to practice Mindful Journalism, and in fact, the Middle Path espoused in the book “is a composite of the moral/ethical, mental development, and wisdom principles that none of the contemporary religions of the world could dispute.” They give three reasons for suggesting Buddhism as an appropriate template for a new moral compass for journalism. First is that Buddhism gives the tools for the individual to ascertain the “truth” through personal experience (observation and investigation) rather than through an expert or divine intervention. The second is that in the Kalama Sutta the Buddha has espoused his followers to tackle doubts and uncertainties in their own mind by not listening to repetitive sayings or hanging on to tradition, but to go out explore the truth, ponder, experience it and then analyse it themselves and believe in it. Which is well suited to the practice of investigative journalism. The third is that the eight-fold path provides a moral compass for the practice of journalism that encourages moral integrity. Although critics would try to dismiss this book as “utopian,” the authors argue that it may be the time to de-Westernise journalism to enable the restoration of news as a social good rather than letting it plunge further into the realm of a profit-motivated commodity signifying greed and clinging, a major cause of unhappiness in the world.